Our unique gravity-flow winery uses natural processes to nurture wines that bear the stamp of hand-craftsmanship. Designed in the style of a barn, the two-floor winery keeps primary fermentation upstairs, in the "hayloft," and barrel and bottle storage in the "manger," where sub-grade construction and concrete maintain a perfect wine-aging temperature. Wines are easily moved using gravity and kept at the ideal temperature for fermentation. 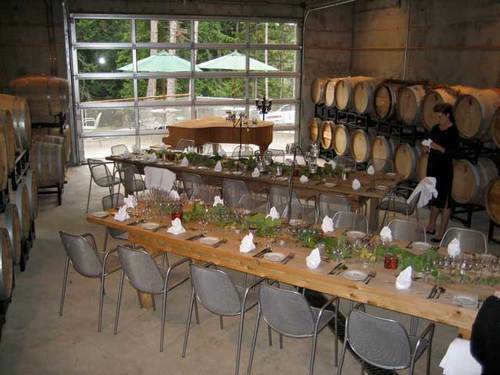 Our winery also features our Barrel Room, where private parties and suppers can be held among the barrels, with the soft notes of our grand piano in the background. 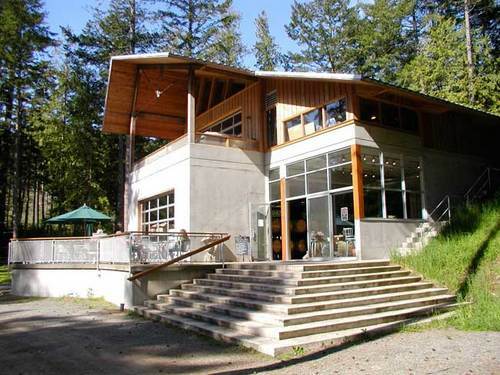 Morning Bay's unique gravity flow winery imitates the shape of a traditional barn: cool lower floor or "stable" for wine storage, lofty upper floor for stainless steel tanks. And lots of terrace space for a glass of wine. 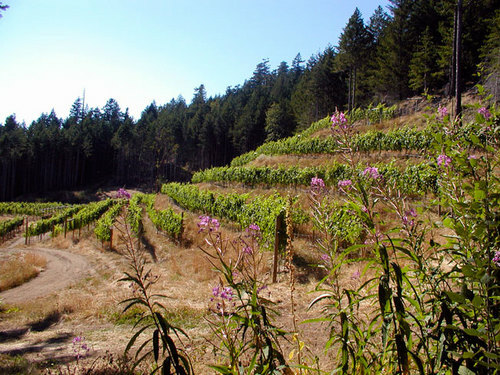 The view from the 400-foot altitude top terrace of Morning Bay's Mount Menzies Vineyard. 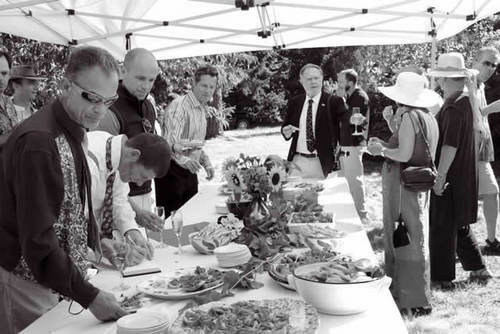 Make your dream Gulf Island wedding come true: An oceanfront vineyard, a sunny summer afternoon, a crowd of friends and family sipping bubbly in the shade. Or perhaps exchanging vows high in the terraced vineyard with the distant mountains in view. Or a romantic candle-lit barrel room, surrounded by casks of wine slowly aging as a pianist slowly weaves his magic on our grand piano.